Ian, with other Honors students in Game Design and Development. Front row, second from the left, in a black jacket. My GGP friends and Family, I’m on the last real day of orientation here at the Rochester Institute of Technology in Rochester, New York, where I am an honors student and will be studying Game Design and Development for the next four years of my life. Despite being, essentially, nerdvana, RIT is an extremely social and active campus. Those of us in the IGM (Interactive Games and Media) department here at RIT have weekly events to explore other aspects of our major. As an Honors Student, I am expected to act as a public face of the university and volunteer or participate in student leadership positions as part of my yearly advancement requirements. I know that my experience with the GGP, both in gigs and in aiding new students learn the gig book, has greatly contributed to my position here, and I encourage those of you who are new, and those of you who I knew, to take initiative and be involved in the orchestra- you never know how it’ll help you. And do chamber music, too- most of my best friends in GGP were the other guys in the Apollo Quartet. Good luck to you all in all your endeavors. Hello there GGP friends and family. I have just moved to Chicago to start my MD/MPH at Northwestern University’s Feinberg School of Medicine. I’ve played chamber music throughout my undergraduate years at Columbia University and even enjoyed playing at Carnegie Hall’s Weill Recital Hall. I recently enjoyed exploring music by Bang on a Can composers, and while my GGP self probably never imagined I’d play in a chamber group with an electric guitar or marimba, I’ve had a blast doing so! Best wishes to the GGP diaspora! As of writing this entry, I am a rising senior at Middlebury College in Vermont, where I major in Political Science and study Arabic. This summer, I have been living in Washington D.C. and interning at an NGO called Vital Voices Global Partnership, which is an organization that identifies and invests in women leaders across the globe working in the human rights, political participation, and economic development fields. I am working in the Middle East and North Africa division, which builds nicely upon my recent experiences: I spent the greater part of the past school year in Amman, Jordan. In the fall of 2013, I studied abroad with Middlebury’s language program, which meant I signed a language pledge agreeing to speak only Arabic throughout my semester. I learned from my host family, from new Jordanian acquaintances, and from my American peers, and overall had an extremely valuable experience, so much so that I decided to take the spring off and stay in Jordan to work with Save the Children at Za’atari Refugee Camp for Syrians. Za’atari is currently home to more than 170,000 Syrians escaping civil war in their country, and is the second largest refugee camp in the world. I was awed by the children with whom I worked at the schools – despite the horror of a now 4-year-old war and the attendant loss of life, loss of home, and loss of dreams, these children never stopped smiling. In the upcoming year, I will continue my studies, help in rebuilding the orchestra, and begin searching for a job in the international development space (yikes!). At various points throughout my time at Middlebury, I’ve played in the orchestra, with a rock group, and in a duet with a classical pianist. 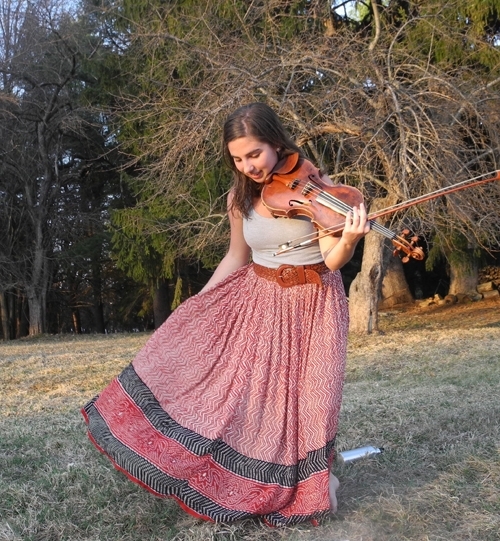 I look forward to reconnecting with my violin this coming fall (it got a bit dusty over there in the Middle East!) as I start playing in a quartet with some classical music friends. I wish all of my GGP peers good luck in their endeavors this year! Break a leg!